All of Lignomat's unique measuring technologies combined: RH Reader for RH BluePeg. Pin and pinless meter for wood. Readings in concrete and other building materials using relative scale. All of Lignomat's unique measuring technologies combined: RH Reader for RH BluePeg. Pin and pinless meter for wood. Readings in concrete and other building materials using relative scale. Dual measuring depth of 1/4" and 3/4" available for pinless mode. A multitask meter for building inspectors, general contractors, flooring contractors, installers, and restoration specialists. 3-in-1: RH testing, pinless meter (wood & concrete) & pin electrode E12. Performs RH testing, same as the Ligno-Tec RH kit. Acts as a scanner for pinless moisture readings in concrete AND wood! Acts as a pin-type meter with the E12 Slide Hammer Electrode. Over 125 settings for different wood species plus selectable specific gravity for non-programmed species. Quickly measures concrete for further assessment. Pinpoint areas with great moisture, for possible grade issues or other remedial action. 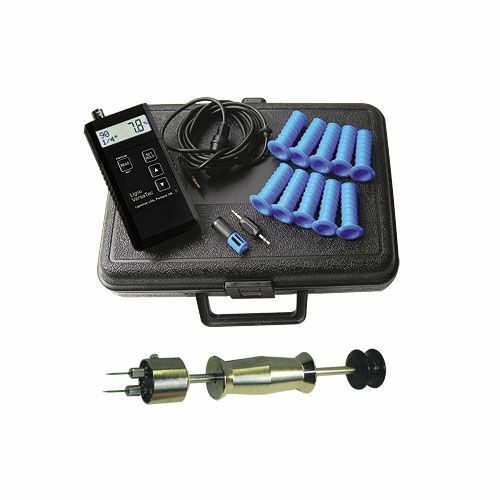 VP-4 Pro Package includes: 1 RH BluePeg Sensor, 10 Sleeves with Caps, 1 RH-PC Cable, 1 Adaptor RH, 1 Case SM, 1 Slide-Hammer Electrode E12 for Wood with BNC cable, 1 pair each DA 1 1/2" and DZ Pins 1" plus multiple function meter.